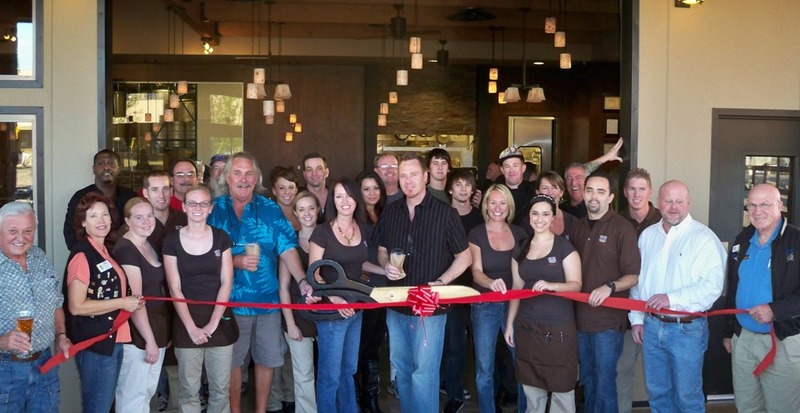 The Lake Havasu Area Chamber of Commerce Ambassadors held a ribbon cutting for the College Street Brewhouse & Pub’s grand opening and new membership at 1940 College Drive. Just a quick drive to the north side of town, you’ll find yourself at Havasu's hip new brewhouse and pub. Here they focus on creating one-of-a-kind handcrafted, award-winning beers and delicious food made simply. They do this not just because they believe in an old-world approach to freshness and sustainability, but also because fresh, local food tastes better, and is better for you. Revelers will appreciate sipping a smooth, flavorful craft brew while enjoying rustic cuisine. Their casual atmosphere, outdoor dining, large bar and views of Lake Havasu are sure to become your favorite place to come and unwind. Pictured from left to right are as follows; Jerry, Chamber Ambassador Nancy Leamons, Tom Otero, Nicholle, Justin, Andrea, Darryl, Brother Dewey, John Hughes, Marisa, Nichole, Kyle, Dina Weatherson, Anthony Crossley, Tim, Lon Weatherson, Nick, Justin, Brian, Sabrina, George, Amie, Sarah, Rusty, Kevin, Bill, Lee, Jerry and Chamber Ambassador Bob Keller. For more information, contact them at (928) 854-2739.